Bill Hicks: Lo-Fi Troubadour will be released by Comedy Dynamics on December 14, 2018 on iTunes, Google play, Spotify, physical CDs and more. Bill loved music. It was a big part of his life and his comedy. He wrote many songs over the years and often traveled with his guitar while he was on his comedy tours. After shows, in his hotel room, he would play his guitar and write songs. After Bill died his family found boxes of songs Bill had recorded. To honor Bill’s love for music, the tapes were taken to Abbey Road studios in London where they were re-mastered. 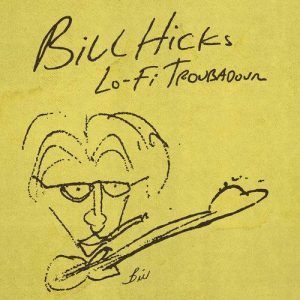 Lo-Fi Troubadour contains 17 original Bill Hicks’ songs, 6 of those being released for the first time here. “Bill was an artist in every way possible and Lo-Fi Troubadour is a great example of his creative power and unique view of life.” said Brian Volk-Weiss, CEO of Comedy Dynamics. Comedy Dynamics, a Nacelle company, is one of the largest independent comedy production and distribution companies, producing Kevin Hart’s Guide to Black History, Animal Planet’s Animal Nation with Anthony Anderson, the new scripted comedy on Hulu, There’s… Johnny!, History’s Join Or Die with Craig Ferguson, MTV2’s Wild ’N On Tour, and Hulu’s Coming To The Stage. In 2018, Comedy Dynamics began releasing original films in theaters starting with the acclaimed documentary, Poop Talk. The company has worked with a wide range of established and emerging comedic talent including Tiffany Haddish, Kevin Hart, Aziz Ansari, Jim Gaffigan, Katt Williams and many more. In total, 12 of Comedy Dynamics’ releases have been Grammy-nominated, with 2 wins.